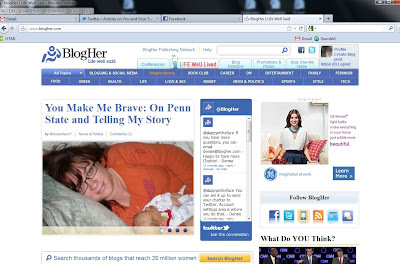 Thank you so much for sharing your story on BlogHer.com – I’m so glad it was able to reach so many people. I’d like to feature your follow-up post today on the homepage of BlogHer.com. There were more things in the message. I know there were, but I was too busy almost falling out of my chair to read them. Julie from BlogHer was very kind. We messaged back and forth, getting the details ironed out. Now, all I have to do is look at the homepage to see my image and my words. I am so stunned y'all. I just this second received a Facebook comment from my foster brother from when I was in high school. He said, "Thoughtful, generous, and brave. Great work on this and your Fox News piece, Jo!" Needless to say, I am in tears (again). I cannot possibly tell you all how much your words and support and love have meant to me these last few days. I just don't have the words. I keep hearing from everyone about how brave I am. I have a confession to make - I'm really not so brave. I'm scared to death. But more than that? I am ANGRY. So very angry that yet more children have been through these horrible experiences. People had a chance to do something about it but instead literally walked away when they could have made the most difference. Someone from work asked me yesterday if I wanted to be a writer. You know what? I really don't. I say what is on my mind and if a few people find it useful than I'm happy. If you read one of my posts and know that you are not alone in the world? It makes my day. Another thing I really don't want to be is an activist. I am passionate about the things that matter to me: birth, family, breastfeeding, mental health and being able to live the life you were meant to live. But, I really don't want to be the 'poster child' for anything. I just want to offer quiet support when it is needed. Unfortunately, I'm not sure if I necessarily have a choice about being a writer, or an activist for that matter. The boys that were assaulted at Penn State? The kids that are hurting all over our country and world because they are being hurt by the very people that should be protecting them? The children that are being abused and neglected and ignored by the system and the people around them who know but do nothing? They don't have a voice. They can't stand up and say STOP IT. They can't protect themselves. We have to protect them. So if that means that I have to continue to shout from the rooftops? I will. If that means I need to show my face and talk about my abuse? I'll do that too. If that means I have to keep writing these words and sharing these stories? So be it. P.S. Some of you have expressed concern that I am taking care of myself during all of this. Please don't worry. I am doing ok. This is tough but also so very liberating. I'm making sure I take my meds and have a therapy appointment next week. If this all gets to be too much then I will step away and take a break. Promise. Bless you, Jo. And thank you.